Heurista was engaged to develop an art program that would launch in new construction projects, with the potential to spread throughout the hospital. Local artists were interviewed and submitted examples of their work for consideration. Photographers, painters, collage artists and sculptors were chosen. Several pieces were commissioned specifically for this purpose, including the Sunbeams collage by Stephen Lange. Stephen works with reflective sign maker’s tape to create intricate, iridescent artworks. Painter, Jean Cauthen provided several works. While some originals were displays, most paintings were reproduced in gicleé, a method of high quality full color printing directly to canvas. Doing so reduced costs and eliminated the need for securing the artworks behind glass. "I Doubted if I Would Ever Come Back", Jean Cauthen, Oil Painting, 60" x 48"
The art program is scalable. The hospital has negotiated rights to reuse all of the chosen photography and has a library of other artists and artworks at the ready for expansion into other areas of the hospital. Furthermore, a relationship has formed with local art representative Sarah Frisbey and her store, Bottega. 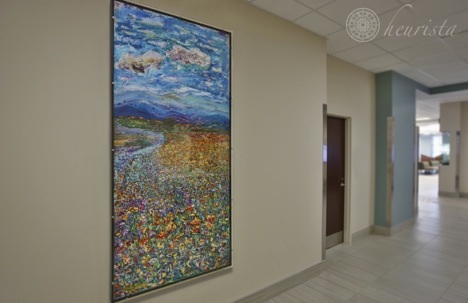 This allows for a rotating collection of artwork, some of it for sale, in the main lobby of the hospital. Heurista provided overall project management, including vision-setting, negotiation with the artists, location planning, resourcing and budget and schedule management. This project dovetailed well with our other projects telling philanthropic stories at Catawba Valley Medical Center.